High winds and heavy snow fall can cause a problem for even the most resiliant of trees. Hidden structural faults or asyemtrical canopies can cause all kinds of issues, from snapped branches, to windthrown trees. 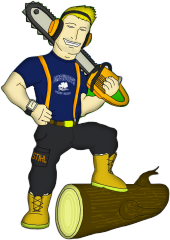 We offer a 24hr call out service for emergency works to make any fallen brahches or trees safe. A call out fee will apply depended on location and urgency of work (eg out of regular working hours).